We're still waiting for SMS support. Google’s scattershot messaging strategy has one less problem. 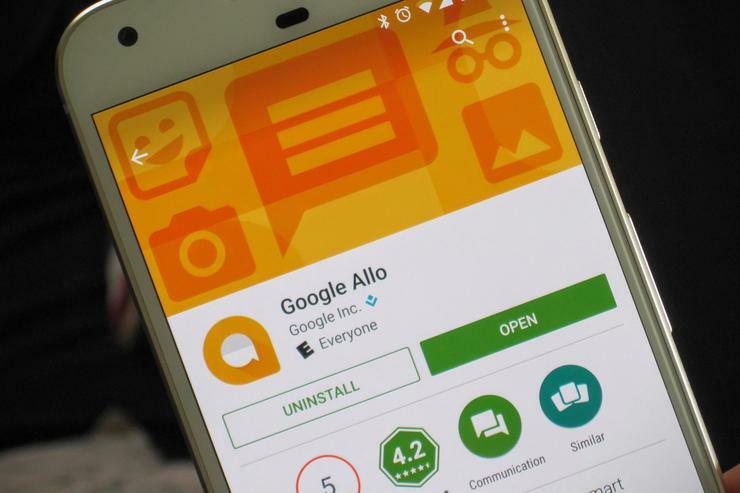 Starting today, Android users can log in to Allo on the web to see and send messages, but it probably won’t make the chat platform more popular. For one, there are a lot restrictions. You’ll need an Android phone. It only works through the Chrome browser. You’ll have to get the latest version of Allo (16.0.024) before you can link your account. And the biggest one of all: Your phone will need to be online and running the Allo app for the web interface to connect. In other words, it’ll be quicker in most cases to just use your phone. 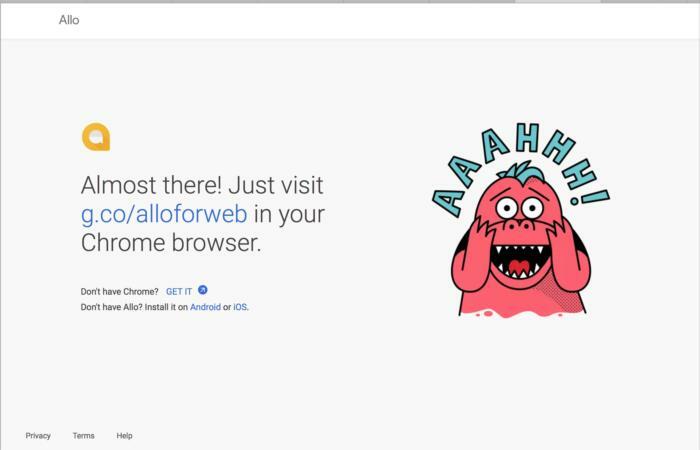 If you try to use Allo on a browser that isn’t Chrome, a monster will show you the way. Why this matters: Well, we’re not really sure it does. While the idea of an Allo web interface sounds exciting in theory, in reality it’s just another Google messaging platform to ignore. Allo never took off the way Google hoped it would, and an extremely limited web app that requires phone tethering is unlikely to get new people to use it. Until Google offers proper SMS in Allo, the app will continue to wither in the Play Store, with or without a web interface. Criticism aside, the Allo web interface is a pleasure to use. To get started, visit Allo for web in your Chome browser, where you’ll be greeted with a QR code. Then, open the app on your phone, tap the side menu button, and select Allo for web. (If you don’t see it you’re probably running an older version.) It’ll switch to a viewfinder so you can scan the QR code on your computer screen, which will link your PC and your phone. 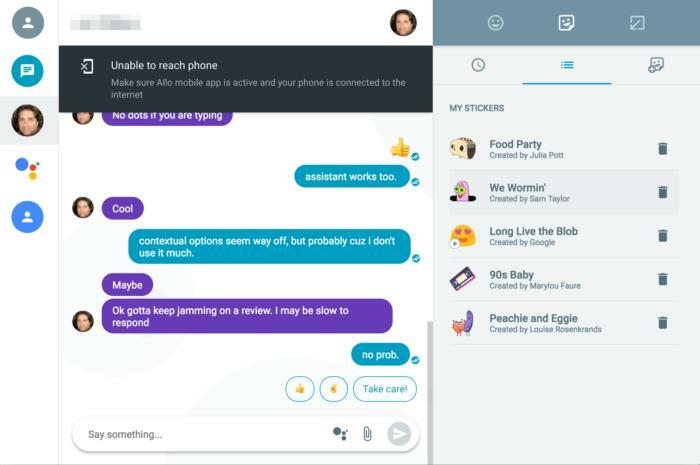 Allo for the web is a breeze to set up, but you’ll need your phone. And that’s pretty much it. All of your conversations will be pulled over (assuming you have Google Drive backups turned on), and you’ll be able to quickly continue a conversation or start a new one. Nearly every Allo feature is supported, including group chats, incognito conversations, stickers, and, most importantly, Google Assistant. The Allo web interface is just as easy to navigate as the mobile one, with a sidebar of your conversations and a collapsible list of your sticker packs. You can summon Assistant into conversations by clicking the button in the conversation bar and attach files, but there’s no way to access the camera, so you won’t be able to make selfie stickers. Additionally, you lose out on one of Allo’s best features, an iMessage-style animation that indicates the other person in your conversation is typing. Allo’s web interface looks as good as it does on the Android app. If the latest version of Allo hasn’t appeared on your phone yet, you can side-load the Google-signed APK from APKMirror. iPhone users are out of luck at the moment, but Google says iOS/Mac support is coming soon.